Since late last year there has been much activity taking place in one particular corner of Chōjamachi, Isumi. 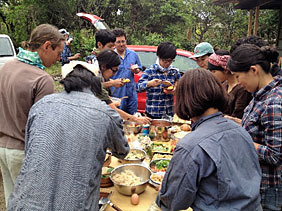 Renovations were begun on a kominka (a traditional-style, wooden-built Japanese home), with the plan to eventually make it the center of a retreat at which peace activists can explore permaculture and other practices aimed at achieving positive change in the world. One of the core objectives of the project is the building of community through working with and for the benefit of others. The process of repairing and reconstructing the Permaculture and Peace Dōjo (as the kominka is known) therefore incorporates events at which members of the general public are able to participate in the renovation, learn about the project and meet others. 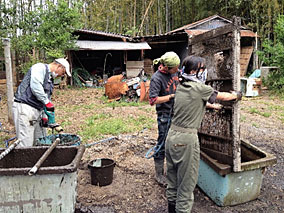 In early May, I was lucky enough to be a part of the earthen plaster workshop held at the Dōjo. In this post, I’d like to explain just a little about what we got up to. The day began at 10am under brilliant sunshine with participants making their way down the tree-lined path that leads to the secluded Dōjo, entering the building and seating themselves on the newly-laid wooden floor that provides an inviting meeting and greeting place. The coordinators of the Permaculture and Peace Dōjo project, Kai and Nao, had invited Kyle Holzhueter, a ‘straw bale builder’ and earthen plasterer, to lead the day’s activities. 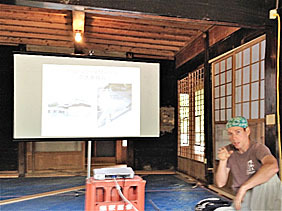 Kyle began things with a short lecture on the history and intricacies of plastering in Japan. This included an account of how many of the motivations for particular design choices in Japanese building are founded in the nation’s geology (the prevalence of earthquakes necessitating ease of repair, for example) and culture. He also introduced us to some of the properties of the material that make it practical and efficient as a resource in construction. This was brought home to me particularly clearly when he revealed that the plaster we would be using had as a primary constituent the decades-old plaster that had been stripped from the very walls that surrounded us. •Removing loose and damaged plaster from the walls. Dusty work! •Breaking down the old plaster and mixing it with fresh soil sourced from nearby. •Adding water and straw to the mixture in order to bring it to the correct consistency that would allow it to bind when applied to the wall. While all of these tasks were in themselves interesting, perhaps the most fun was had in mixing together the various ingredients of the plaster. In order to do this on a large scale, a tarp was laid out and four walls created so that we could step inside and stamp, walk and dance it smooth. And it is no exaggeration to say that the plaster was danced smooth, as there was an impromptu Bon Odori performance that took place, complete with music! It was around midday when we all broke for lunch. As is normally the case at events held at the dōjo, in order to encourage sharing and foster a sense of comradery everyone brought with them one item of food to distribute amongst the whole group – potluck style. This resulted in a great array of foodstuffs, many of which were handmade by those that brought them. From organic onigiri to homemade bread, and pickled vegetables to fruit salad, it was a veritable feast! Lunch also gave everyone the opportunity to chat and get to know each other a little better, as well as grill Kyle further on the art of earthen plastering. I wouldn’t say I was uneager to get back to work but it was certainly difficult to pull myself up and away from the delicious food and banter. Once the afternoon arrived, it was time to start applying the first base-coat of plaster to the walls. 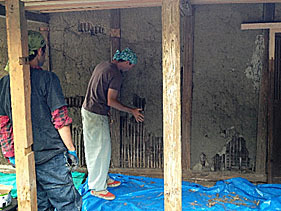 Carried out either by hand or with the aid of a trowel, Kyle showed us how to work the dark, coarse, muddy mixture against the bamboo slats that lend the walls structure. This was perhaps the most satisfying and yet difficult part of the job, as for every handful of plaster I managed to attach to the wall, another handful seemed to fall to the floor. It appears to me at least, that it is one of those tasks that can look incredibly easy but in fact requires hours of practice in order to get the angle of your hand or the trowel just right and the pressure against the slats correct. Nevertheless, with a little instruction we managed to complete an amount we could all be proud of. 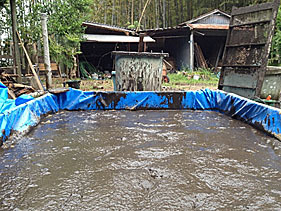 So, with mucky hands and some tired muscles, I left the Permaculture and Peace Dōjo with a greater understanding of a little of the work that goes into renovating a kominka and the satisfaction that can be had in working with others outdoors. I’m happy that living in Isumi will give me a chance to hopefully meet many of the friends I made that day again, while also seeing the dōjo project develop and grow over the coming months. It’s incredible learning of the resources that surround us, and how sharing time and knowledge can build something amazing. Copyright (c) NPO Isumi Lifestyle Laboratory, all rights reserved.